Consequences of Tamil Nadu Bus Strike seems totally bad. 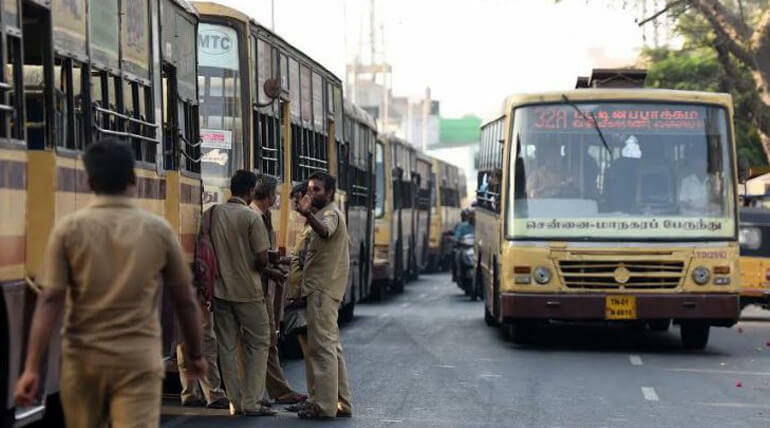 After the failure negotiation of Tamil Nadu Transport department with Transport Ministry of Tamil Nadu, Transport Unions entered in an indefinite Strike from mid night without any formal notification. Following the strike people of Tamil Nadu and the transport unions are facing severe consequences from morning. Financially the transportation had reached to an indefinite height for the public. The main reason was the private transportation, considered the strike of government transport worker will stands as a chance of good collection for the day. The private transport organizations are collecting double fair from passengers. Auto rickshaws are also taking part in this mass bribery at Chennai and other big cities. Office workers, School and College students got frustrated enough, in fact they are the main victims of this strike. On the other side, Namakkal depot had been driven to run their buses with truck drivers due to lack of enough drivers in the depot. ADMK MLA Raja Krishnamoorthi has jumped in action at Anthiyur, Erode district. He drove the bus by his own from Anthiyur to Bhavani following the drivers regretted to take the bus on road. In the mean time the Madras High court had banned the strike and condemned the workers to get back to work. If they regret to do so the court had ordered the transport department to take immediate actions on them like Suspension or Dismissal. The high court had also advised transport workers, in a way of irresponsibility that is, "Those who are not convenient with the salary given by the government can resign their job and can get apart". On the final course public had been treated as foot ball between the government, the transport unions and the private transportation.